From "Bruce Robert Carlson" to "Hoss" to "Spark-Plug" to "yeolde1", Bruce was a man of many hats. Do you know this man, with the silly Moose Hat upon his musically inclined cranium? If so, we would like to hear from you. We are trying to fit his puzzle of life together and you may be one of the missing pieces. Please email either Henry or Mel at the contact link above. Otherwise, enjoy the site. The pages within this site are for and about Bruce Carlson. If you want to add a story of your own, please use this form or email it as you want it to read, to the contact link above. You will also notice that there are an awful lot of "unique links, which are italicized", and they can be searched out underneath each article that they pertain too. You will also find links at nearly all the images. Bruce would like to share these hidden links with all his friends. Mel and I and another couple volunteers have devoted our spare time in doing research and will be doing a fund drive in the near future to secure a domain name for Bruce's future site. If you are interested in lending a helping hand, again, please send us an email and let us know. 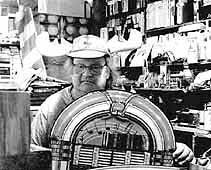 Bruce Carlson, a wearer of many hats, was probably best known as the owner of Ye Olde Record Shoppe, in Diamond Springs, California. He was also a Senator in the Hangtown Jaycees, and member of the Toastmasters Association. Along with being a Hangtown "Dry Diggins" Jaycee and Toastmaster member, Bruce was originally from Copper Harbor, Michigan. Word has it, that as he later moved to Winchester, Wisconsin, he was one of the first owners of a motorized boat. Bruce also wore a fisherman's hat! This photo here, was taken at the Carlson's family resort, in Winchester, Wisconsin. We hope to have more photos, of Bruce and his family soon. Stay in touch for updates. He also served in the U.S. Army and the U.S. Forest Service. He held many credentials, notably one as a teacher of Horticultural Science at Los Rios Community College District. He taught ROP (Regional Occupation Program), for Ponderosa High School, here in El Dorado County. Ponderosa High School "Original Page"
Ponderosa High School "New'er Page"
Bruce attended Wausau High School, in Wausau, Wisconsin. Bruce, also enjoyed playing on the Curling Team, so we hear. We are still searching for his post High School days and will post the findings accordingly. Fire season is upon us and it's a good time to be a little bit safer with those matches, oh and count me in on your next BBQ...! Thanks for taking the time to drop on by and check out Bruce's Memorial Site. Although there is more to see, I realize the hectic schedule of everyone out there, and so just in closing this particular page, I wish you all the best and remember to cover your bases. Everyone needs to make out their own Will and make sure your loved one's are remembered. Bruce never pursued this and his whole "out of control" collection at Ye Olde Record Shoppe, was auctioned off recently, for a mere $5,500.00..!!!! It happened to Bruce and it can happen to you. Thanks for taking the time to stop by and say hello, and don't forget to check out the rest of the site There will always be another update, so come on back.